Imagine a system for making your own modular furniture that invisibly and firmly clamps itself together on-site while the glue sets - no clamps or tools needed for final assembly, just a glue bottle. Or a knock-down version where joints can be built and dismantled with a tiny hex key, nearly invisible other than a small hole beneath or behind the joint. For example, you could build up a unit in the workshop, pack it flat in the car boot, then reassemble in the client's room. This in essence is the Lamello P jointing system. This article looks at how the Lamello P system works, how you can use different versions for different applications and what are their pros and cons - but first a bit of background. It was Lamello that first developed biscuit jointing in the post-war 'utility' period as a rapid method for securely joining wood products using oval slices of compressed hardwood. 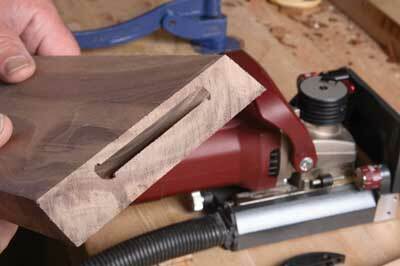 The jointer cuts a curved slot, then the biscuit is slid in with glue. 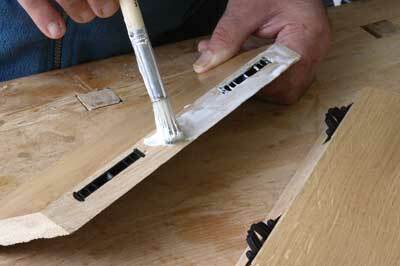 The materials must then be firmly clamped together while the glue sets. Lamello went on to develop high-quality portable jointers in the '60s since when other companies have followed suit, generally with more economic offerings. Other than different methods of alignment and extraction, technical changes in the world of biscuit jointing have been few and far between for nearly half a century. The need for clamps has been a common feature of previous biscuit jointing techniques and this has particularly limited the use of biscuit joints away from the workshop. Even in the workshop, clamps are cumbersome things, expensive and heavy to use in large numbers with potential to pull furniture out of shape as the glue sets. The P system, which removes the need for external clamps, is therefore a logical development of Lamello's original biscuit-jointing invention. 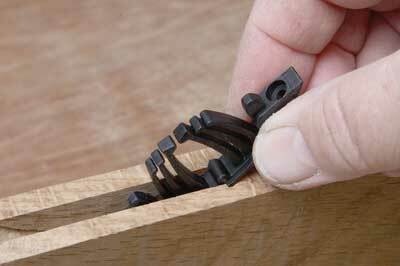 Rather than using compressed beech (Fagus sylvatica) wood biscuits that slide straight in or out of a slot, the connectors in the P system are moulded with a ridge around the edge. Because of this they must be slid endwise with a curved motion into a matching T-shaped slot, and they can only be removed in the same direction. The ridge is trapped in the wider rim of the slot which strongly resists any force to pull the connector straight out. Once pairs of connectors have been joined, either by a self-locking catch in the Tenso or by a cam in the Clamex, they cannot slide sideways. 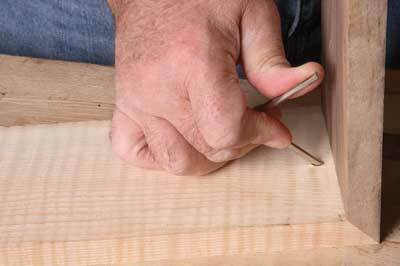 This means the joints are firmly mechanically locked in place, even before any glue is applied. Tenso P connectors are specifically designed to work with glue. Clamex P connectors can be used without to allow for dismantling, but alternatively the surrounding wood could be finally glued if required. Bisco P is a one-piece biscuit made to the same thickness as the central slot of the P system and used for alignment between connectors. 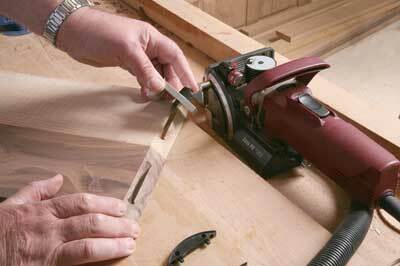 At the heart of this system is the Lamello Zeta P2, which is by no means an ordinary biscuit jointer. As well as the Swiss-made precision long associated with Lamello's other products, the Zeta P2 has an additional axis of movement called VMD â€“ vertical mechanical drive. 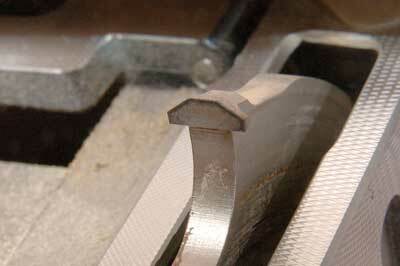 This automatically makes the cutter's arbor rise and fall momentarily when it reaches the limit of its stroke. The Zeta's cutting disc is a small diameter circular saw blade with tungsten carbide teeth overhanging on either side of the steel disc. The brief up and down motion at the end of travel is the ingenious secret of how it sweeps out a T-section slot - wider around the rim than inside it. 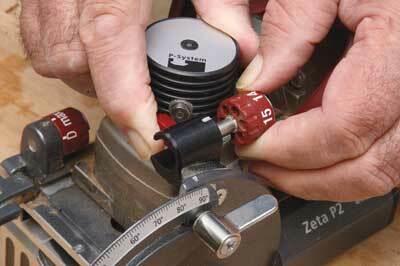 The Zeta has an extra control called the 'P system depth adjustor'. This has a dual function of limiting depth of cut according to the size of fitting and triggering the VMD to make the T shape. It also has the normal adjustable depth stop like all biscuit jointers, but this is set to max to be out of the way when using P system. In use the Zeta P2 is like a normal biscuit jointer with a fence and guides for mitred, right-angled and other angled joints. 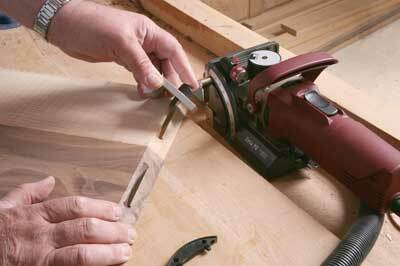 The fence provides accurate positioning of the cutter while careful hand-held alignment is needed to hold the soleplate of the jointer flat against a mitred edge. 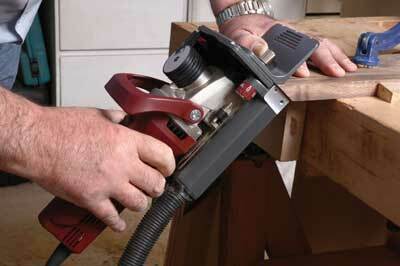 After initial set-up the extra motion of the cutter is fully automatic and barely noticeable to the user. The Tenso P14 connector is the latest innovative device in the P system. 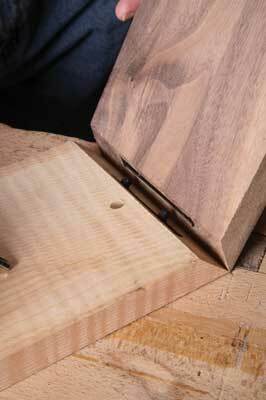 This is specifically designed to pull together glued joints with a strong preset tension. 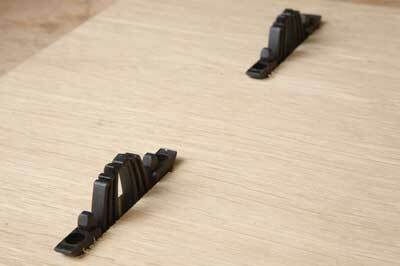 Once fitted the connectors are totally invisible with no external holes. 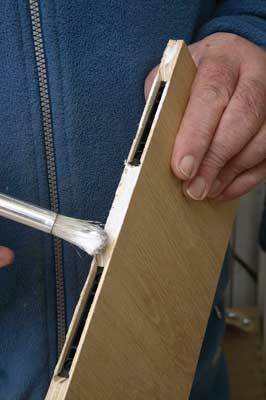 The closing action is provided by a set of stiff but flexible prongs, which snap into a socket in the other side of the joint while the glue sets on the wood surfaces to provide a permanent bond. I made up some sample joints in oak, plywood and MDF. They pulled themselves up tightly with fine glue-lines and, once the glue had set, the joints were as good as normal clamped ones. The depth of the connector is 14mm so in principle it cannot be fitted into the face of boards less than 15mm thick. 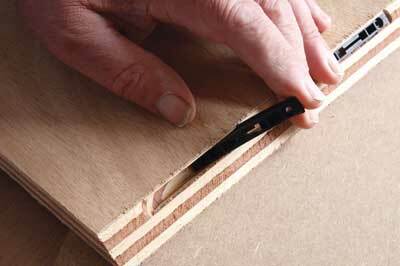 However, the way around this when joining boards edge to face is to reduce the depth of the face slot and increase the depth of the corresponding edge slot. 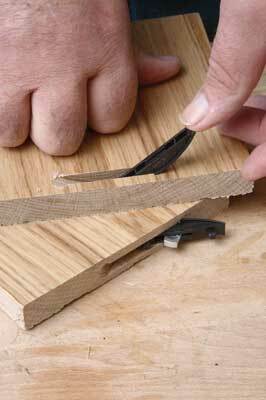 This shifts the connector joint line into the edgewise board but still leaves a strong enough grip into the face board for gluing. At a pinch it is possible to pull Tenso connectors apart by hand should the need arise, provided you haven't fitted many and you can get enough purchase on the wood. Warming the connectors - which I tried with a hot-air gun - reduces the clamping force by slightly softening the prongs and this makes it easier to prise them apart. Clamex P connectors fit into T-sectioned curved slots in the same way as the Tenso ones. Rather than having flexible prongs the Clamex uses a hooked metal cam to engage in a corresponding slot and pull two halves of the joint together. 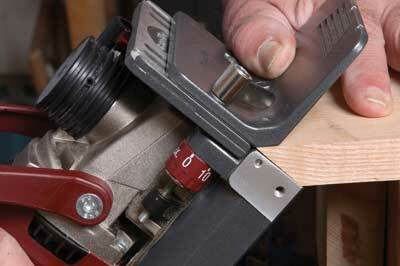 To fix in place, an Allen or hex key is inserted through a hole where it engages in a hexagonal socket in the cam. to the slot and at a precise distance for the key to be inserted into the biscuit to turn the cam. 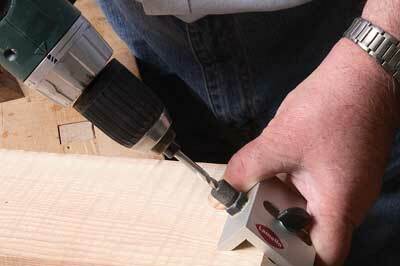 A drilling jig is supplied for this. 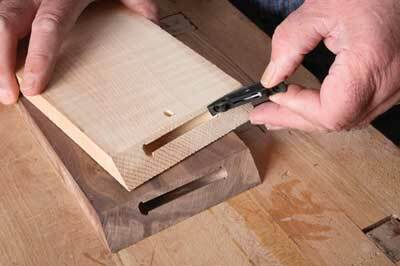 The holes are normally arranged by the maker to be hidden beneath or behind the joint. Plastic cover caps are available in many colours or makers could produce plugs in matching wood. 16mm thick while smaller Clamex P10 connectors are available for use in panels down to 13mm thick. Also in the range is a strange hybrid connector, which is called the Clamex P Medius 15/10. This connector has a shallow socket designed for fitting back to back in a 16mm or thicker dividing panel. Alternatively, you could stagger the connectors to stop them from clashing. The initial reaction of many makers is probably that while the Lamello P system looks very attractive, it is a big commitment in these times to fork out £1,300 on a new jointing system, so we need to think carefully through the pros and cons. 1. The clamp-less Tenso P opens up completely new opportunities with furniture sub-assemblies being glued together on the client's premises. 2. 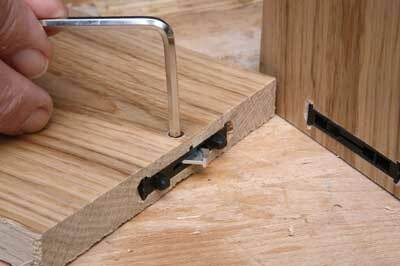 Tenso joints allow sections of furniture to be snapped together in the workshop, then work can proceed on the project without clamps getting in the way. 3. Clamex P biscuits offer an elegant system for making knock-down furniture joints that are barely visible, again for easy transport and assembly on-site. 4. The Zeta P2 is a beautifully made machine and with Lamello's reputation you can confidently expect it to be a pleasure to own and use for a long time. 1. The Zeta P2 machine is expensive and might appear beyond the budget of many small-scale furniture makers. However, depending on the type of work this could be justified by efficiency savings over a number of projects. The economy of not needing to use a van or extra help for delivery and installation might also offset the cost. 2. The price of consumables is quite high, Clamex connectors costing more than - £1 each and Tensos a bit less â€“ compare this to biscuits at a few pence each. However, by saving time, the P system may be economic and help win more jobs. Also there are quantity discounts. Some makers might go with a hunch that the Lamello P system would be worthwhile to bring in new work and increase throughput, while others may be certain this is not for them. I suspect most of us, however, would need to think long and hard about future projects and how we might work on them. I think I would draw up spreadsheets with detailed costing before making this sort of commitment. But I must admit I am already tempted! An alternative to the P system is the older Clamex S connector, which is held in its slot by two small screws. 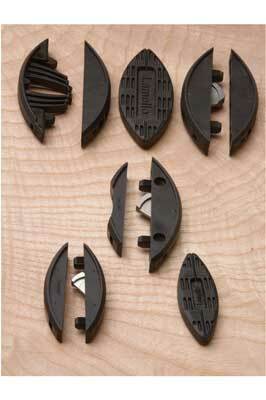 This means the slot can be cut with a conventional biscuit jointer equipped with a thicker blade. While avoiding the need to invest in a Zeta P2 machine, I doubt if this fixing has anywhere near the same strength so more connectors may be needed. An alternative to the Zeta for batch makers with access to a CNC machine is a diamond-tipped cutting tool and software available from Lamello to drive it on suitable machines.